It is the time of year we do our New Year’s resolutions, and I have mine as well. Personal: I am going to take time for me! Until very recently, I had a retail job. I also teach, sing in a community choir (my favorite thing! ), serve a Board of Directors, and sing extracurricularly through one of my schools for 2 cantatas a year. Plus I have this blog and my TpT store. In 2015, I’ve promised myself, and my husband, that I will be home more often, occasionally say no, and spend time at home without being attached to my schoolwork. Professional: I am going to do some things this summer that will be essential for me to renew my certification. I’m not 100% on what I want to choose, but I’m excited!! I can’t wait to tell you when I decide! Classroom: I am working through creating/editing concept plans. While I haven’t taken Kodaly Certs yet (and it’s on my list!! ), I follow that method of teaching, and am trying to be as particular as I can. As I work through these, I will definitely share! 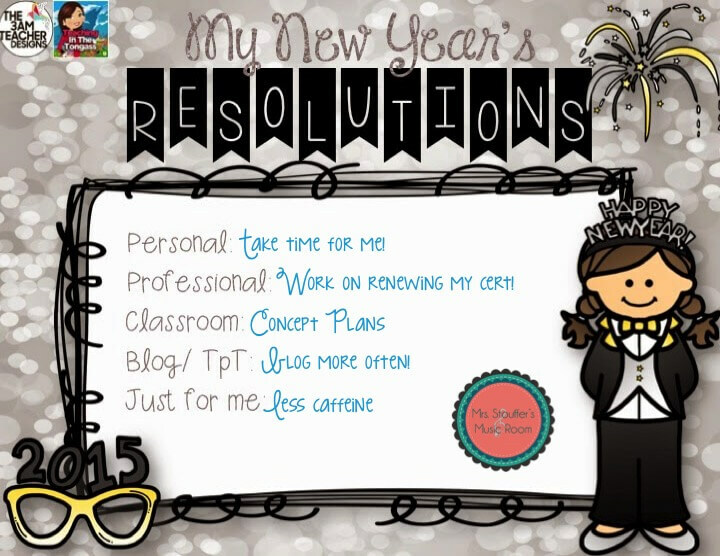 Blog/TpT: I vow to blog more often. I’m aiming for 2 times a week! I come up with lots of ideas, but I never follow through on them. This year, I’m going to devote more time to the blog. Just for Me: I am going to drink less caffeine and more water! If you know me in ‘real’ life, you know I am attached to a coffee cup and leave them everywhere. My cups often get delivered to me in the middle of the day with the memo ‘you let this here…’. (Now you know my M.O.) Refillable, paper, lidded, unlidded. Cups everywhere. Coffee and tea. Not just the fancy stuff from Starbucks either. Most of the time, it’s from my coffee pot at home. By the time I got to December with my crazy concert schedule (9 performances! ), I was leaving water bottles everywhere instead. I felt great! I definitely want to keep that going!